lenses offer optical patients the ability to see clearly without the restrictions and limitations of prescription eyeglasses. This popular method of vision correction is great for all refractive disorders, including nearsightedness, farsightedness, astigmatism, and presbyopia. Enjoy the benefits of clear vision without the hassle of fragile eyewear by visiting the optical professionals at EYE ENCOUNTERS. With four convenient locations throughout Philadelphia, receiving a contact lens exam and contact lens prescription has never been easier. Many of our patients at EYE ENCOUNTERS enjoy contact lenses over eyeglasses because they find it liberating to not have to worry about scratching their lenses during activities. Nor do they have to worry about having a pair of prescription glasses on hand in case it gets sunny outside. Without eyeglasses, our patients who lead an active lifestyle can participate in any type of sporting event without the use of safety glasses to protect their eyeglasses. At our Philadelphia optical boutique, we also treat many patients who have higher eyeglass prescriptions that often create optical distortions or reflections because of the thicker lenses. With contacts, you won’t have to worry about the thickness of a lens, because there won’t be anything obstructing your face. 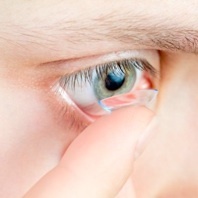 Additionally, contact lenses do not have the same limited peripheral vision like eyeglasses. When it comes to prescribing contact lenses at EYE ENCOUNTERS in Philadelphia, our opticians work closely with our optometrists to ensure proper fit and lens materials appropriate not only for your optical prescription, but the shape of your eyes. When you visit our Philadelphia optical store, we’ll take the time to educate you about proper contact lens care and use. We’ll show you how to put in your contacts safely and how to remove them at night. To learn more about the comprehensive benefits of wearing contact lenses, come visit any of our four optical locations in Philadelphia. Our opticians and optometrists will carefully walk you through all the pros and cons of switching from eyeglasses to contact lenses.